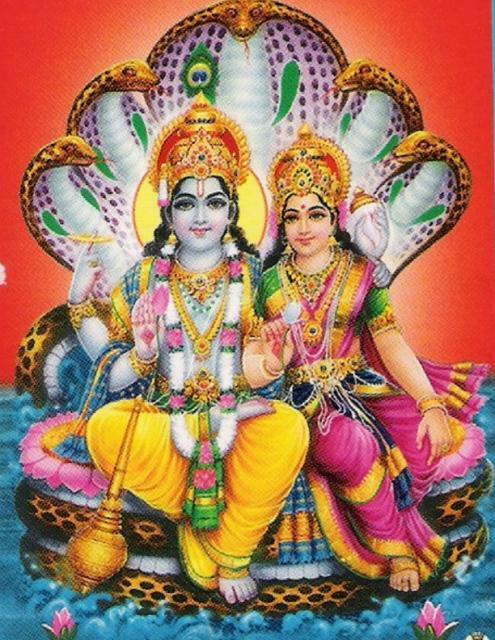 In this part we will explore the meaning of the 50th Shloka of Sri Vishnu Sahasranamam. Bhagavan puts people to sleep using His Maya or His power of illusion. He is independent and does not require any support from anyone to carry out His activities. He is all pervasive and omnipresent. He is present in many forms and as Antaryami resides in every being. He engages in the multiple activities of Creation, Sustenance and Dissolution on His own will. He resides in every being and every being resides in Him. He is very affectionate towards His devotees and loves them deeply. He protects His devotees like a mother protects her child. Bhagavan has the whole world in His Garbha and He has everything that can give happiness within Himself. He is the gem His devotees seek. He grants His devotees the greatestest of wealth quickly which is Moksha and Bhagavan is the bestower of this great wealth on His devotees who totally surrender Unto Him. 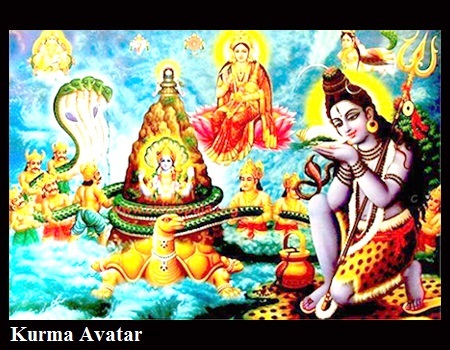 Sri Adi Sankara interprets this Nama as ‘Praaninah Svaapayan Atmasambodhavidhuraan Maayayaa Kurvan Svaapanah – He puts people to sleep by the use of Maya or His power of Illusion, hence He is called Svaapanah’. Bhagavan can be realised only with His divine grace. Sri Parasara Bhattar’s interpretation is that Bhagavan in His Mohini Avatar, He lulled the Asuras into a trance, using His beautiful smile, sweet glances and the play of eyebrows and thus made them forget that He was distributing the nectar to the Devas exclusively. Sri Satyadevo Vasishtha interprets this Nama as “Svaapayati Nidraapayati Pralaya Kaale Sarvam Prakritaaviti Svaapanah” – He puts everyone to sleep at the time of Pralaya (Deluge). Even though He makes everyone sleep, He Himself is wide awake. This Svaapanatva Guna of Bhagavan is reflected again in everything He creates after the Pralaya (Deluge) also. The Sun puts everyone to sleep during night hours , but the Sun does not sleep. Meaning: I am not perceivable to most people immersed in the cloud of Maya or illusion. The ignorant in this world cannot understand Me, the unborn and Imperishable. His Paratva has been concealed to the non-devotees because He appears like all of us in His body, appearance, and talk etc. in his many incarnations and so they don’t recognize Him as ParamAtma. He who does not see what is in front of Him is as good as a person who is sleeping. The Dharma Chakram writer gives the analogy of the animal life vs. the human life. Humans are “awake” in the world of intelligent reasoning, in which the animals are “asleep”, i.e., they are not capable of operating in this domain as well as humans can do. Similarly the ordinary human is asleep to the world of the jnani. Meaning: It gives a good life, fame, wealth, a loving family and rages to ground all travails facing devotees and grants the rule of the Sky and Earth with benign grace. It gives a man, strength and all that there is, with love that exceeds a mother’s love. I have learnt that the Narayana Nama is the Mantra that bestows all such riches and pure good. Thus, the path for the ordinary human to become awake in the world of jnanis is to chant the Narayana mantra. This is the lesson we should take from this Nama. Sri Parasara Bhattar explains that after Bhagavan assuming the Mohini Avatar, puts the Asuras to sleep. 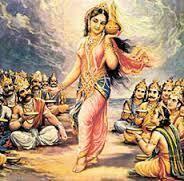 He plays His Leelas’ as He likes with the Devas and Asuras, demonstrating His absolute independence. The expression here is that Bhagavan is not under the control of anyone or anything. He does not need anyone’s help or support for whatever He does. Everything else is under His control. He does His acts of Creation, Sustenance and Dissolution as He wishes. Bhagavan is Sva-vashah because He has everything that He desires within Himself, does not have any desire outside of Him, and rejoices with His own Self. The Dharma Chakram writer points out that it is only when one does not have any need that one can be totally independent. Thiiruvalluvar refers to Bhagavan as “Vendudhal Vendaamai ilaan” meaning one who has no desires. Sri Andal had composed “Kuraivu ondrum illaadha Govinda” meaning Govinda has nothing lacking) deficiency or has any unfulfilled desire. When our mind controls us rather than us being in control of our mind, we lose our independence and succumb to whatever our mind fancies/desires. This Nama teaches us that we should learn to exercise control of our mind instead of being controlled by it. By meditating on this Nama of Bhagavan with discipline we can exercise better control over our mind. Sri Adi Sankara gives two interpretations for this Nama. The first is ‘Aakaashavat Sarvagatatvaat Vyapee – He pervades everywhere like the sky, hence He is called Vyaapee’. Bhagavan is all-pervasive and omnipresent. Aakaashavat Sarvagatashcha nityah iti shruteh – He moves everywhere like the sky’. Sri Adi Sankara’s second interpretation is ‘Kaaranatvena Sarvakaaryaanaam Vyaapanadva Vyaapee – Since He is ultimate Cause of all Causes, He remains in every action as its fundamental basis. Thus, He occupies not only all space but also all action. So He is Vyaapee on both counts. Sri Parasara Bhattar’s interpretation is that Bhagavan pervades everyone with His own Power and gives energy to them. At the time of churning the Milky-Ocean, He pervaded the Devas, the Asuras, the Mandara Mountain, Vasuki and others, and gave them the energy to churn the Ocean. Meaning: He who swallowed all, reclines in the cool Ocean, resides in every drop and in the Universe itself, complete on Earth and in the sky, hidden everywhere, in every atom and cell continuously, forever. Meaning: Beyond the Unmanifested (Prakriti) is the all-pervading Purusha devoid of all distinctive marks or characteristics. Knowing whom the mortal man is emancipated and attains immortality. Swami ChinmayAnanda points out that the philosophy of pervasiveness indicates subtlety. Bhagavan is all-pervasive, and hence He is subtler than the subtlest. Since the Cause pervades the effect (e.g., gold pervades all gold ornaments), so also Bhagavan pervades everything as He is the Cause of everything. The Dharma Chakram writer observes that All-pervasiveness also implies limitlessness, since whatever there is and wherever it is, Bhagavan pervades it, and so there is no limit to Him. This limitless Emperumaan just projects Himself in such a way that whatever little we see is based on our limitations. Meditating on this Nama of Bhagavan will broaden our ability to see this Limitless Sarva-Vyapee. Sri Adi Sankara explains this as ‘Jagadutpatti aadishu Aavirbhoota nimitta shaktibhih vibhootibhih Anekathaa tishthan Naikaatma – He manifests himself in multifarious forms which are revealed in His various activities beginning with the Creation of the world to the various energies and splendours displayed by him’. Each of His Creation is a form of Himself, so He is NaikAtma, not confined to any one particular form. Sri Parasara Bhattar’s interpretation is that Bhagavan assumed several forms at the time of churning – as MahaVishnu to help the Devas and Asuras to churn, as the tortoise to support the Mandara Mountain, and as Mohini to distribute the nectar. Sri Radhakrishna Shastri reminds us of the similarity between this Nama and Nama 139 – CaturAtma. A more general interpretation is that Bhagavan expresses Himself through all the forms of His Creation. The Dharma Chakram writer points out that the different forms of Gods that the followers of different religions worship are all an expression of Bhagavan and it is because of their ignorance of Bhagavan being a NaikAtma that they think they are worshipping different deities and fighting within themselves. Meaning: I am in everyone’s heart as the Supersoul. Whom-so-ever wishes to worship their Ishta-devata, I sustain their faith firmly in that God. Hence the Lord is Sarva-Vyapee or Omnipresent and All Knowing. Meaning: Agni is That, Aditya is That, Vayu is That, Chandrama is That, Bright One is That, Brahma is That, Waters are That, Prajapati is That. Meaning: O’ Lord! You are our Father and Mother, You are the only refuge of all, as You are the bestower of everything for our survival. This Nama is a logical sequel to the previous Nama. He not only takes diverse forms, He also performs many activities. Sri Adi Sankara interprets this as’Jagat utpatti sampatti vipatti prabhriti karmaani Karoti iti Naikakarmakrit – He is engaging in a wide variety of tasks such as Creation, Protection and Destruction of the world, hence He is called Naikakarmakrit – person of many activities’. Sri Parasara Bhattar explains this Nama by giving the example of His churning the Ocean for nectar, supporting the mountain with his Kurma Avataar, overcoming the enemies, distributing the nectar, etc. Meaning: The way you participated in the churning of the ocean for ambrosia, the spell you cast to help the gods leaving out the Asuras with your Mohini Avatar, these enter my heart and melt my soul. O Lord on the Adi-Seshan, tell me how may I seek you. Meaning: The Lord came as a tortoise and placed a mountain on His back, rolled a serpent over it and held it without falling, then churned the Ocean for ambrosia. Speaking His Namas alone is worthwhile speech. The Dharma Chakram writer gives a view which summarizes all of the above by pointing out that everything that ever takes place is His action and nothing else. We are instruments in His Creation. From one mango tree only, another mango tree can come, and we can’t create something else from a mango seed. We are the instruments and He is the Karta. If we have this realization, the benefits (Karma phalam) of none of the actions for which we are the instruments will accrue to us. If nothing accrues to us, we are not afflicted by our actions and become liberated. If we give up the doer-ship in our actions and dedicate all our actions to Him, we can become liberated. Sri Satyadevo Vasishtha continues his interpretation based on his previous interpretation of NaikAtma. Bhagavan who is in many forms (father, mother, son…), performs many actions in the form of the father, mother, son, etc. Through the next few Namas Sri Parasara Bhattar brings out Bhagavan’s Guna of being the Embodiment of Dharma. The word is derived from the root ‘vas’ meaning ‘to dwell’. Bhagavan resides in all beings as a way of administering His dharma – for bestowing fruits in a just way for the acts of all. He also lives as Antaryami in everyone in order to guide them towards the path of Dharma according to their merits and qualifications. Sri Adi Sankara explains this as ‘Vasati atra akhilam iti Vatsarah – the whole Universe resides in Him, hence He is called Vatsarah’. In the Bhagavad Gita (Chapter 7 Verse 12) Bhagavan says ‘Matta Eveti taan Viddhi na tvaham teshu te mayi – Consider all beings to be evolved from me – Not only do I live in them, they also live in me’. In the Dhyanashloka 2 we saw ‘Antastham yasya Vishvam – In whose interior the whole Universe resides’. Sri Parasara Bhattar refers us to the following mantra about Bhagavan which brings out this point – Sarvaantashcaarine DharmAtmane – Unto Him Who is the embodiment of Dharma and Who lives in all beings. Vatsarah also refers to time – the period of one year. Bhagavan is the continuum of space and time, in which all creatures live. 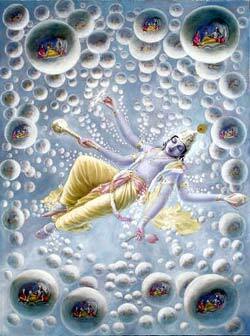 So He is the endless space and infinite time, hence He is Vatsarah. Swami ChinmayAnanda analyses the word as ‘Vatsan rati iti Vatsarah. In Krishna Avataar, He restored the calves to the Gopas when they had been taken away by the Asuras, so He is Vatsarah because He gave away the calves (Vatsa here is interpreted as calf). This Nama signifies that He has extreme love for His devotees. Sri Adi Sankara interprets this Nama as ‘Bhakta snehitvaat Vatsalah – He loves His devotees intensely, hence He is called Vatsalah’. Meaning: Those who follow this imperishable path of devotional service and completely engage themselves with faith, making Me the Supreme goal, they are very, very dear to Me. Swami ChinmanayAnanda translates the word as “Supreme Love”, and points out the significance of this Nama – Bhagavan Sriman Narayana is Love Incarnate. Sri Parasara Bhattar points out that this Nama explains that Bhagavan wants to guide everyone by being their Antaryami as expressed in the previous Nama because of His extreme kindness towards His devotees. This affection is like that of a cow to its calf and He refers to Sri Andal’s Pasuram 12 of Thiruppavai – ‘Kanaitthu ilam katrerumai kandrukku irangi, ninaittu mulai vazhiye nindru paal Sora’ meaning that Lord Krishna was so compassionate to the plight of the buffaloes as there was no one to milk them, that the simple thought of their calves’ results in pouring milk from their udder creating a pond of milk. Sita Piratti’s words of advice to Ravana were – Vihitah sa hi dharmajnah Saranagata-Vatsalah – It is well-known that Rama is virtuous and that He is very affectionate towards those who have sought refuge in Him. The Dharma Chakram writer gives several examples of Bhagavan’s Guna of Vatsalya. Guha became a close friend of Rama. Bhagavan also gave Himself completely to Hanuman (which was revealed when Hanuman opened his heart and showed Rama residing there). Sugreeva and Vibheeshana’s Saranagati are other examples of His extreme love for His devotees. During the Mughal period, Malik Kafur invaded South India (during 1310-1311). 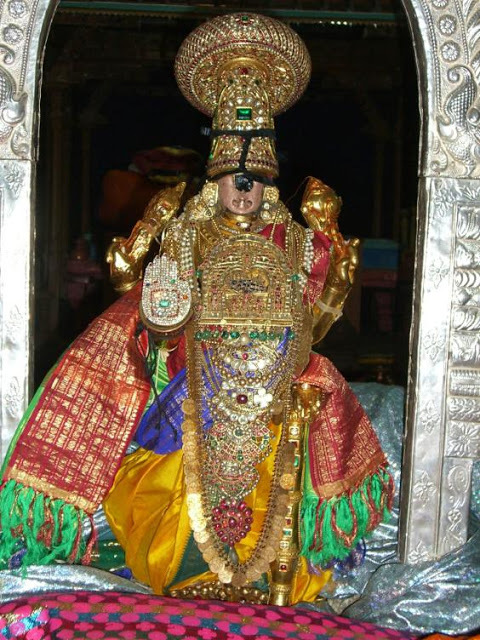 The temple authorities in Srirangam learnt that Kafur was planning to plunder the temple. The inner temple was fiercely protected by a group of staunch Vaishnavas. They held his army out for three days – sufficient time to build a wall in front of the main sanctum, thus hiding the gigantic idol of the reclining Lord. The priests even managed to bury the idol of Ranganayaki under a Bilva tree, but before they could save the Utsavar of Ranganathar, the army broke in. The invaders ruined the idols that they came across by breaking them into pieces or they simply defaced the idols thus destroying the sanctity of the idols. The smaller Utsavar’s which were exquisite pieces crafted from the expensive Panchaloha (An alloy of Gold, Silver, Copper, Lead and Zinc) were melted and added to the treasury of the Sultan. They took off the statue of Alagiyamanavalar Perumal and plundered the treasures, jewels and ornaments which belonged to Srirangam temple. The whole city of Sri Rangam wore a forlorn look. According to legend, one brave woman, a temple dancer who could not bear her separation from Manavaala Perumal, followed the army all the way back to Delhi, tracking the idol. She came back to Sri Rangam with vital information on the whereabouts of the Utsavar. Since she had followed the Lord all the way through, in history, she came to be praised as ‘Pinn Thodarntha Valli’ – The lady who followed. With the information given by the danseuse, a few young men came forward and vowed to bring the Utsavar back from Delhi. “We will neither sleep nor eat until we behold our eyes with the beauty of our Arangan”, they pledged and made a master plan. After a couple of days, a few of the men set out to Delhi, disguised as an entertainment troupe, headed by the danseuse Pinn Thodarntha Valli. Meanwhile at the palace of Alauddin Khilji, the soldiers had taken in the plundered riches. 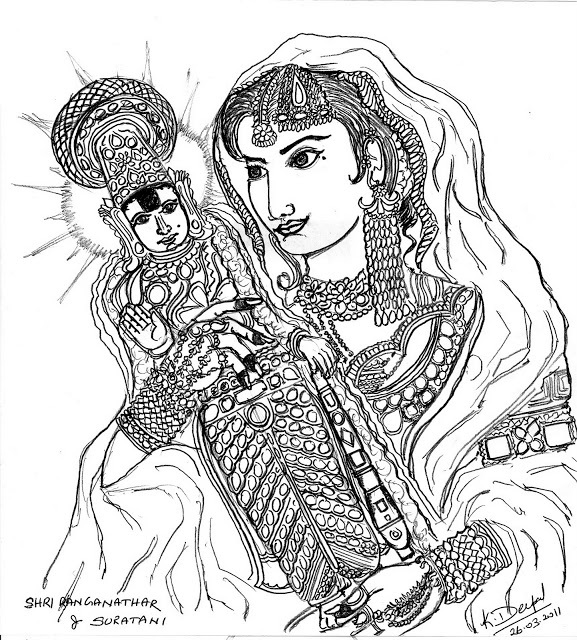 The princess of Delhi Suratani, the daughter of the Sultan, was drawn by the beauty of the Azhagiya Manavalan that she pleaded with her father, not to melt Him and give it to her for playing with as a toy. Bemused by his daughter’s affectionate request, Khilji allowed her to have the idol, and Suratani immediately carried the idol to her room, dancing in joy with the great Lord in her arms. She was drawn by the charming beauty of Azhagiya Manavalan that she became inseparable from Him and fell in love with the Lord Arangan. She became so obsessed with Him that she never left Him even for a moment. She bathed Him in scented water, dressed Him up in the best of silks, shared her food, and even slept with the idol. Pleased with her deep love for him, Ranganathar appeared before her every night and offered her, visions of his various forms and Avathars. While the princess immersed herself in her deep love for Azhagiya Manavaalan, the entertainment troupe from Sri Rangam finally reached Delhi and asked for permission to perform before the Sultan. When the permission was granted, on a sacred Ekadashi day, they performed before Khilji’s court. Alauddin Khilji was so enthralled with their performance, that in return he was willing to offer them anything that they desired. They asked for the statue of Arangan and the King gladly granted. However the group was aware of the Princess’s obsession with the Perumal and knew that she would not part with it willingly, so they waited for night fall, and when the princess was in deep sleep, they retrieved the idol and started out to their city. They rushed back fearing the outcome when the Princess realised that her Lord was missing. Suratani was indeed very distressed to find her Lord gone. She at once left in search of her Lord in a horse following the entertainment troupe. Fearing for her safety, Malik Kafur followed the princess with his huge army. Frightened by the sight of the large army on their trail, the entertainment troupe scattered. A few of them finally reached Tirupathi and entrusted the idol to one Kodavar leader, his son and his nephew for safekeeping. The group then split up once again and went into hiding to meet back at Sri Rangam later after things settled. Back at Sri Rangam, Suratani searched frantically all over the place for the idol. Not finding it anywhere, Suratani gave up her life before the very doors of the sanctum. As her mortal coils hit the ground, a blinding light emerged from within her and merged into the doors of the sanctum – Her soul had united with the Lord. The death of the princess, however, stirred up a deep fury within Malik Kafur. He ordered all the Vaishnavas to be killed. The temple somehow survived this catastrophe. After much discussion, the head priests then secretly ordered for another identical Utsavar to be made and installed it in the place of the original one. Sri Ranganathar appeared in the dream of the chief temple Bhattar and pronounced that he had now taken Suratani as his bride, and that she too had to be given all the respects that were given to the other Ubaya Naachiyaars. When the Bhattar conveyed his dream to the temple officials and the other residents of Sri Rangam, they were all amazed by the love that Suratani had for Sri Ranganatha. A shrine was built for this Muslim bride of Lord Ranganatha, and she was given the title of Thulukka Naachiyaar. Since Islam shuns idol worship, she was enshrined in the form of a painting, richly decorated with inlaid gems and gold, and is worshipped as such even today. After 60 long years the Kodavar family finally came out of hiding, and set out for Sri Rangam with the Lord. However, when Ranganathar arrived at Sri Rangam, there were no celebrations. Instead, pandemonium reigned at the temple as there was already one Utsavar existing in the sanctum. The people who had witnessed the disaster were long since dead and gone. Doubting the originality of the idol and the story of the Kodavar family, the priests did not allow the deity to be brought into the inner shrine. Instead, they stopped the deity at the Aryabhattal Vaasal in the third prakaaram and gave him no entry. Interestingly, that very night, Ranganayaki appeared in a boy’s dream and asked him to lead the Bhattar to a particular Bilva tree in the third prakaaram and dig under it. The boy too dutifully did the same and out came the long ago buried statue of Ranganayaki. The Bhattar understood the gravity of this find, and so did the priests of Sri Rangam – the idol waiting at the Aryabhattal Vaasal was indeed the original Rangar. They immediately passed on the news to the King, who was, however, still skeptical about the deity. After much thought, the King asked the priests to search for any living soul whose memory went back to Muslim invasion. It was then that the old and blind temple washer-man came to their rescue. “Bhattar Peruman,” he told, meekly, “if permitted, I can identify which of the two statues is the original one. Years ago, when I was but a small boy, my father used to give us Theertham (sanctified water) squeezed out from the clothes of the Utsavar. I am very much used to the taste of the Theertham. Therefore, by in taking the Thirumanjana Theertham of the two Utsavars, I could possibly recognise the original one.” he offered. The Bhattar too agreed, happy at the prospective solution. 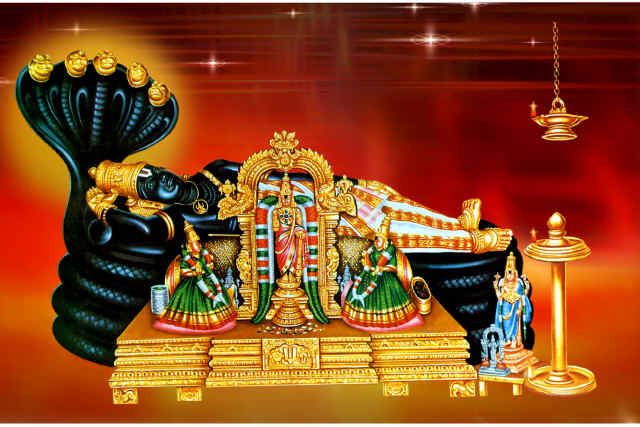 Immediately Thirumanjanam was performed to both the idols and the Theertham was given to the washer-man. At once, the washer-man identified the original statue to be the one that was brought in by the Kodavars. Out of ecstasy he shouted in Tamil, “இது தான் நம் பெருமாள் (This is our Perumal).” The entire temple rejoiced at the recovery of the ancient statue. After sixty odd years, the original Utsavar was finally reinstalled in the temple amidst much pomp and splendour. However, the other Utsavar could not be left alone, for it too had been worshipped for sixty years. The Bhattar, therefore placed it near Rangan’s feet and continued to offer oblation to it. Even to this day, in Sri Rangam Sannidhanam, we can see two Utsavars receiving worship. Also, the shrine to Suratani is found near the Arjuna Mandapam, next to the main sanctum. Once a year, the Kalyana Utsavam of Thulukka Naachiyaar with Arangan is celebrated with great pomp and show at her shrine. In testimony of her unflinching love, to this day, Arangan’s breakfast naivedhyam consists of Sweet Roti’s, Raw Milk and Butter, cooked in Mughalai style. They are first offered to the Naachiyaar and then only offered to Rangan. Later, when betel leaves are offered to the Lord after his meal, it is a custom to apply the lime (chunnambu) on the front side of the leaves (like the Muslims do), as compared to the more traditional rear side. 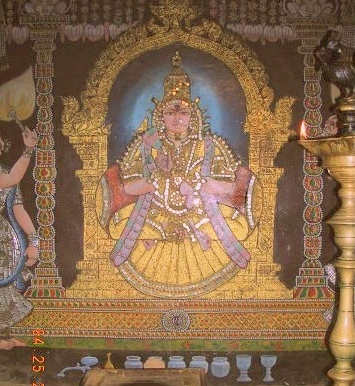 Also, unlike other Vaishnava temples, the Utsavar dons a colourful lungi, as compared to a white silk Panchakacham during his Thirumanjanam (ritual bath). This is famously known as Kailee (Muslim word for Lungi) Thirumanjanam, and is yet another mark of the Islamic culture on the traditions of the temple. Sri Adi Sankara gives two interpretations for this. The first is ‘Vatsaanaan Paalanaat Vatsee – He takes care of all those dear to Him, hence He is called Vatsee’. Meaning: But those who always worship Me with exclusive devotion, meditating on My transcendental form — to them I give what they lack, and I preserve what they have’. The second interpretation is ‘Jagatpituh tasya vatsabhootaah prajaah iti vaa Vatsee – Since He is the Creator or father of all beings, the whole set of beings are His children, hence He is called Vatsee, the one with countless children’. 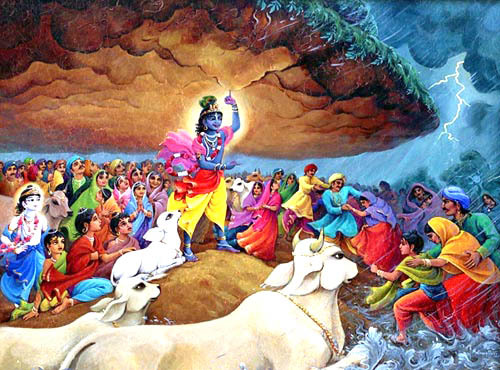 In His Gopala incarnation, He protected the calves during the episode involving Indra. Another interpretation refers to the innumerable hosts of souls who are to be always tended by Him, like a cow tends to its calf with affection. Sri Satyadevo Vasishtha observes that Bhgavan’s Guna of being the Protector reveals itself throughout life. Even before the child is born to a mother, He makes sure the mother has the milk to feed the child as soon as it is born, like the bird knows how to transfer (feed food to their young ones through their beaks) food through their beaks, etc. Sri Adi Sankara’s commentary is based on the Ratnas or gems being treasured in the depth of the Oceans, and since Bhagavan is Himself in the form of the Oceans, He is called ‘Ratnagarbhah’. In his own words ‘Ratnaani garbhabhootaani asys iti samudro Ratnagarbhah – He is the Ocean containing all the gems in His interior, hence He is Ratnagarbhah. Swami ChinmayAnanda refers us to the Bhagavad Gita Chapter 10 Verse 24 – sarasaam asmi saagarah, and observes that Bhagavan is Ratna-garbhah like the Ocean and has all the treasures within His control, and can bestow any wealth quickly to any devotee as He desires. Sri Radhakrishna Shastri extends this to the presence of Ratna in the hood of the serpent and in the knots of the bamboo shoots, which are caused by none other than Bhagavan. The Nama also suggests that Bhagavan protects His devotees like gems, and assists them towards the path of Self-realisation. Sri Satyadevo Vasishtha derives the meaning of Ratna starting from the root ‘ram– kreedayam’ meaning ‘to play or to rejoice at.’ Thus, the word Ratna denotes everything that gives happiness. Since Bhagavan has the whole world in His garbha, He has everything that can give happiness in Himself, and hence He is Ratna-garbhah. Sri Adi Sankara gives the explanation ‘Dhanaanaam Eeshvarah Dhaneshvarah – He is the Lord of all wealth’. In fact for His devotees He is Himself the Wealth. All wealth is created and owned by Him. Being Lakshmipati, He is wedded to the Goddess of Wealth as well. Sri Parasara Bhattar has interpreted the previous Nama in a broader sense, viz., that He is the source of all wealth. He interprets the current Nama as referring to Bhagvan’s generosity in giving away this wealth quickly to His devotees who wishes for it. The affix ‘Vara’ comes after the root ‘As’ – to pervade, and the word formed from it refers to ‘having the power of granting success soon’ – the emphasis being that Bhagavan is quick in giving the benefit to His devotees. Sri V.V. Ramanujan gives reference to NammAzhwar 3.9.7 – Serum kodai pugazh ellai illaanai – His largesse is limitless and His benevolence is boundless. Sri Anantakrishna Sastri gives the example of Bhagavan giving instantaneous wealth to His friend and devotee Kucela. Sri Radhakrishna Sastri gives an alternate interpretation that this Nama refers to Bhagavan’s vibhuti of being in the form of Kubera, the god of wealth (Bhagavad Gita 10.23 – Vitteso yaksa-raksasam). Swami ChinmayAnanda comments that the term wealth here refers to all things that cause happiness. He is Lakshmi-pati, the Lord of Goddess Lakshmi, and so He is ever the Master-of-Wealth. The greatest of wealth is Moksha, and Lord Narayana is the bestower of this great wealth on His devotees who totally surrender Unto Him. 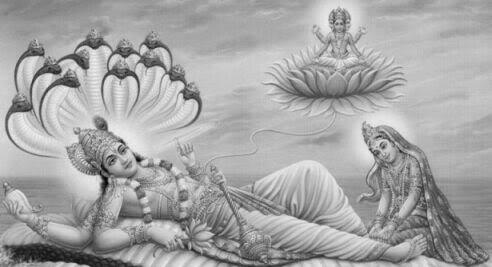 Bhagavan puts people to sleep using His Maya or His power of illusion, hence He is Svaapanah. He is independent and under His own control not requiring any support from anyone to carry out His activities, so He is Sva-vashah. He is all pervasive and omnipresent and hence He is Vyaapi. He is present in many forms and as antaryami resides in every being and hence He is called NaikAtma. He engages in the multiple activities of Creation, Sustenance and Dissolution on His own will, hence He is Naika-karma-krit. He resides in every being and every being resides in Him, so He is called Vatsarah. He is very affectionate towards His devotees and loves them deeply, so He is Vatsalah. He protects His devotees like a mother protects her child and as He is the Creator of all beings are His children and hence He is Vatsee. Bhagavan has the whole world in His garbha and He has everything that can give happiness within Himself. He is the gem His devotees seek, so He is Ratna-garbhah. He grants his devotees with wealth quickly. The greatest of wealth is Moksha and Bhagavan is the bestower of this great wealth on His devotees who totally surrender Unto Him. So, He is called Dhaneshvarah. Guruvu garu ki padabhivandanamulu.thank you for giving meaning of all slokas. Thank you. God bless you!! Hari Om!!! Awesome sir! Looking forward to more. Hari Om! Thank you Tanisha! God bless you! Hari Om! Hari Om Sir, Another divine commentary, feeling bliss as we read it sir. No words to speak. We can feel god’s presence. Thank you sir. Hari Narayana! Pranam Guruji! Another beautiful narration. We can visualise every single aspect of your narration. It all unfolds before our eyes like drama or HariKatha. My Appaji has told us the story of this Muslim Nachiyar’s love for Arangan and how much she missed holding the Lord in her hands. When they tell the story of her love in Harikatha, it would bring tears to our eyes. Similarly you have expressed very well. Thank you sir, your Shloka always brings fond memories to our minds. Hari Om and Vandhanam! I feel very enlightening every time I read a shloka with its meanings and explanation. Sir you are the only one I have come across who gives various explanations in a concise manner. Thank you sir. Great job! Hari Om Lakshmi ji! Thank you 🙂 God bless you! I liked the story of Suratani. She is holding the Vishnu idol tightly like her Barbie doll. Very cute Uncle. 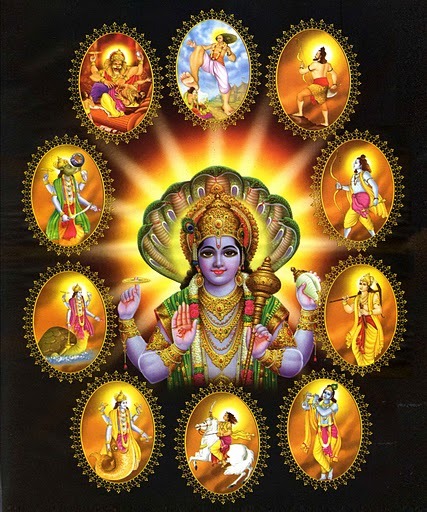 Today I am telling a small shloka of Many of Vishnu’s names. ‘Harim naraharim vandhe Govindham , dadhi Vamanam. If spelling mistakes are there I am sorry Uncle. 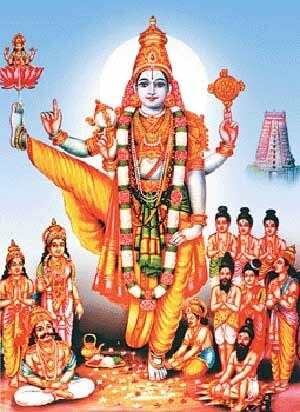 Harim Naraharim Ramam Govindam Dadhivamanam. I am not sure how to interpret Dadhivamana. We all know the Vamana Avatar but this is the first time I have heard of the phrase Dadhivamana. Has anybody any light to throw on this? A possible explanation could be that the Lord likes abhishekam and aradhanai in curd or Neivedhyam or offering of rice mixed with curd (Dadhyonam) are very much liked by him. 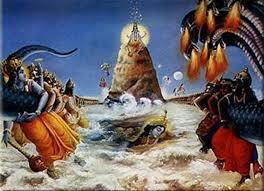 thus fortified (purified) by Dadhi is fitting throne for Bhagavan Hayagriva. Extremely informative and wonderfully written.